Fish cakes, prawn cakes, crab cakes…you name it, there are many kinds of savoury seafood patties eaten throughout the world. They make wonderful appetizers, snacks or as part of the main meal. 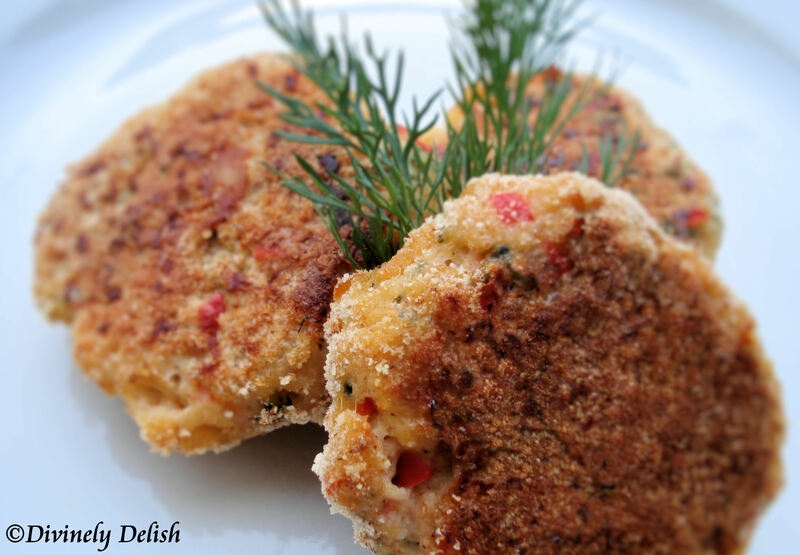 I have tried various ways of making fish cakes over the years, including simple fish cakes using canned salmon or tuna. I’ve added mashed potatoes, breadcrumbs, mayonnaise, or a combination of all of these. This time, I used cod, since I had a pack of fillets in the freezer, and added in some prawns to make something a little different. If you want to know how good these were, let me just say that I devoured three of them even before I had finished cooking all the fish cakes! Tip: If you use frozen fish that has been thawed, make sure you squeeze out all the excess water and pat dry the fish before chopping it up. 1) Place bell pepper, green onions in food processor. Pulse until coarsely chopped. 2) Add cod and prawns. Pulse until finely chopped but not smooth. Transfer mixture to a large bowl. 3) Stir in egg, mayonnaise, mustard, lemon pepper, dill and salt. Add in 1 cup of breadcrumbs. Mix well to combine. 4) Form into patties 2.5-inch (about 6.5 cm) in diameter. Coat patties in the remaining breadcrumbs. 5) Heat butter or oil in a skillet over medium-high heat. Cook patties for about 3 minutes on each side, or until golden brown and fish is thoroughly cooked.